Mooi Bly - Paarl Accommodation. Mooi Bly offers five well-appointed, charming thatched cottages that can sleep up to six people, situated in a big garden with a swimming pool. They are fully equipped, serviced, have private verandas with barbecue facilities and a magnificent view of the Mooi Bly vineyards and Paarl valley. Breakfast is available upon request. 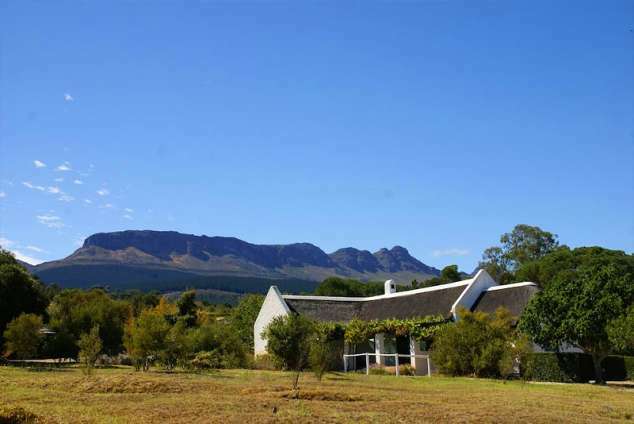 For those who prefer to cater for themselves, Paarl and Wellington are 10 minutes away from the 32 ha estate. Our neighbours have a small restaurant on their farm just arround the corner and there are also a number of nice restaurants in Paarl that offer excellent cuisine. Mooi Bly is an ideal base from which to explore the Cape's Winelands and enjoy its many celebrated wines and restaurants. The estate is a mere 30 minutes from Franschhoek. Cape Town is only 45 minutes away. Mooi Bly Vineyards & Wine cellar. We believe that the roots of an honest product starts with the a love for the earth. With this in mind, our dedicated, enthusiastic team creates fantastic, well balanced estate wines in a traditional way. With our Belgian hospitality we look forward to welcoming you to Mooi Bly vineyards on the slopes of the Du Toit Kloof Mountains. TV with 4 basic channels. Paarl Valley views, Garden views, Vinyard views. From the N1 take the Sonstraal Road Exit 62A. At the T-junction turn left, pass the BP garage, and follow the road for 2km. Turn right into Swawelstertpad and and turn right at the next T-junction. At the fork in the road, turn right onto a dirt road. Continue along the dirt road, and take the first road left, and the next road right. Mooi Bly is the second gate on the left. From the N1 take the first exit after the tunnel Sonstraal Road Exit 62. Directions as above. Take the R301 towards Paarl and turn left onto the Bo Dal Road. Follow the dirt road for 2.7km and turn left at the Mooi Bly sign. Mooi Bly is the second gate at your left hand. 46700 page views since 26 May, 2006. Last updated on 20 Mar, 2019.